Stayed July 2013. Locating the park is a little difficult due to one obscure roadside sign which is not easily noticeable during the day and ever worse at night due to poor lighting. Entry roads are rough and dilapidated. Access to park is off the beaten track. Currently, soldiers have to leave the post and drive around the perimeter of the Fort to gain access, I highly recommend an additional access road be developed from the current fire roads to accommodate the soldiers. This is for the soldiers ...RIGHT? The park personnel are very professional, courteous, and very knowledgeable. Park grounds are very well maintained. 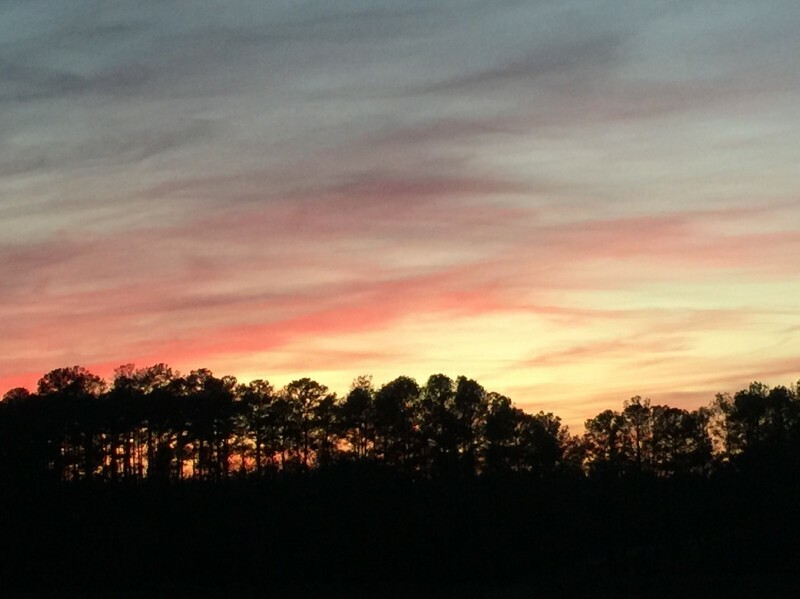 The campsites and cabins are reasonably close to the water and the community house, but the office and general store are a short drive or long walk away from both cabins and campgrounds. Adding a laundry facility would be a plus. This park seems to be always under improvement every time I pass through here. I hate to let the secret out, but this is a great park for it's size. Wish they would expand to wooded areas and more around the lake. We were thoroughly impressed with Weston Lake. After reading the previous reviews, we were a little leary, however, the trip there was outstanding. The staff was very friendly on check-in and made us welcome. PROS: The park along with directional signs, has obviously been upgraded from the reviews I have read. The area is picturesque. The lake with all the rental equipment is the center point of the park. 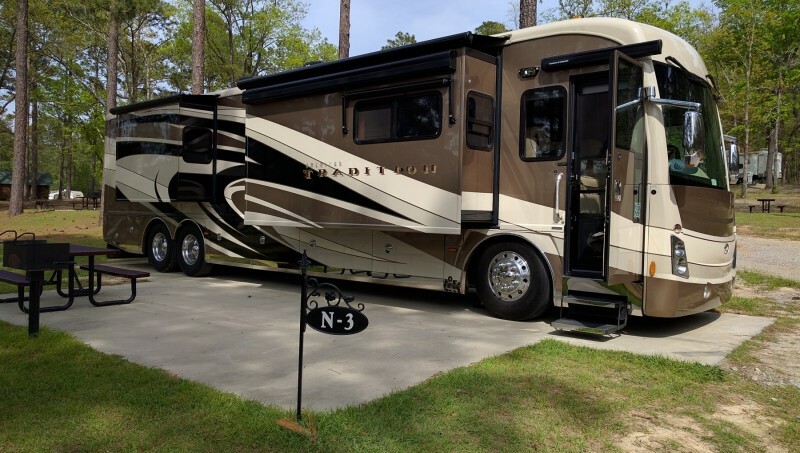 The new RV sites have concrete pads with both 30 & 50 Amp service, water, cable and sewage located on an illuminated post so your spot # can be seen. There is plenty of room between neighbors and each of the new sites has a new table, grill and fire ring. CONS: Directions are poor. When exiting I-77 like we did, start following the signs for Hwy 262 (Leesburg Road). Once on Leesburg Rd, it is in fact 9.1 miles. Keep looking left for the sign for the park. The wifi is the other con. It worked good for the first couple of hours then went dead and was local only(?). A call to the staff reported that sometimes it drops out. Overall, a great stay in a clean, well maintained park with a lot of friendly people. We will be back in the summer with the grand kids. Thanks. My wife and I just left the new campground. It is nothing like it was when I was last there 3 years ago. The facility is clean and well maintained. The staff was friendly and courteous and answered all my questions. All the homesteaders are gone and all camp sites were clean and most sites had satellite set up. Cable tv was also furnished with limited channels. Ft Jackson has added a new water park on post that is really nice and reasonable. It cost me, my wife and grandchild a total of $13.50 to get in. We heard very little firing on the ranges. We will definitely return there when we are in the area. Stayed here 2 weeks. Very quite and relaxing, near the water. Has a small beach for swimming in the lake, fishing, & walking trails. Had water, electric, & sewer hookups at our site. Direct TV, Verizon cell & Internet worked great. Paid $ 11.00 per night. Campground in not on base, but not. Also not far from other shopping and dining out. No laundry at campground, but near by down Rt. 262. I'm not a numbers rater, either I like a FamCamp or not. Well I like this FamCamp. Will stay here again. Stayed at the new camp ground. Huge sites with full hook-ups, 30/50 AMP service, cable TV and WI-FI. The sites have large concrete pads that are level. Everyone was helpful and wanted to make sure our stay was enjoyable. The only draw back is how far you have to travel to use the base facilities. It's about a 20 mile round trip to the PX and commissary. We spent one night here while we were traveling to FL. If you want a campground near “planes, trains and automobiles” this is not the place. This is a very peaceful and nice campground. Each RV spot has new level concrete pads, new fire rings, new elevated grills and nice electric/water hookups. The campground is well shaded. They were working on the cable when we visited so it was not operational. Each site had 30/50 service. We were in an RV so we did not user the bath house. We were driving a 37 foot RV pullng a car and did not have any problems driving in the campground. This campground is a little out of the way but well worth the stop. This was our first visit to Ft. Jackson but won’t be out last. 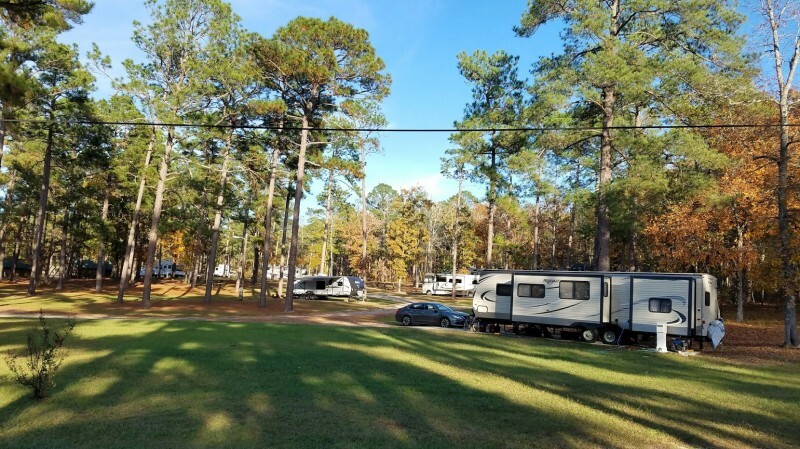 What else can you say other than this might very well be the best Army Campground in the system. 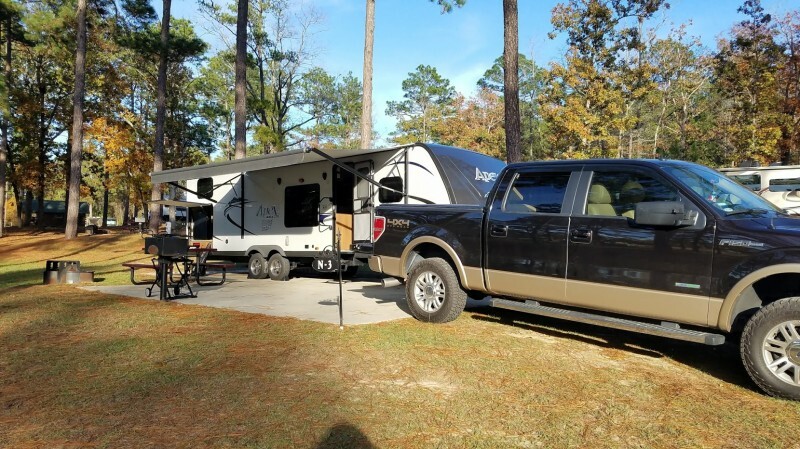 Great job to the MWR and staff at the Ft. Jackson campground. Arrived today and had a wonderful checkin experience. Very friendly staff - 21 brand new sites - quite and peaceful. How can you complain about staying on a lake with a beach, swimming, boating, fishing, hiking, full hookups - all for $17.50. So happy we did not go by the comments cuz we would have missed a wonderful campground. In reading the other writer's comments, one thing comes to mind; What do you want for $9-11 a night! It sits on a pretty little lake with loads of things for kids to do, parents to do, and even the family pet. Go for a walk! It's a wonderful place to walk or jog. The showers have hot water and the bathrooms are clean. But if you still aren't happy, wait awhile for the new campground to open. The prices will go up too, but I guess then the gripers will be happy.